Caregiving support is needed when faced with extreme caregiver stress. Have you tried to be "Superwoman" and instead you feel like your life is falling apart? Self care is the secret to turning around elder caregiving challenges and, also, for the sandwich generation. In the upcoming video, Life Coach and New York Times Best Selling Author, Cheryl Richardson talks to ABC Host Robin Roberts and presents some clues on how to get started. Does your life resemble the women in the clip? The life lessons that Cheryl presents seem counter-intuitive. To take better care of your family, to best meet the challenges you have to face every day, you have to start by taking care of YOURSELF. Self care is the secret to surviving the most overwhelming challenges. 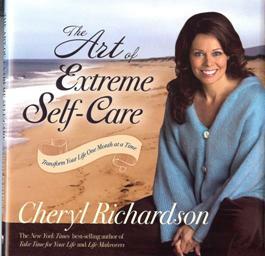 Cheryl proposes some seemingly radical and controversial remedies. What she's really doing is providing the only way off the speeding raceway that's going to cause you to crash at the other end. You are important. Your life is important. Your first and most essential source of relieving caregiver stress is YOU. Your self care will restore and renew you, so that you can get on with the rest of what is important. 3. What can you postpone? 4. Now most important, what can you take on just for you?